on the last weekend in September. For 2009 the dates will be: Saturday and Sunday, September 26 and 27. 2008 National Alpaca Farm Day was another successful event. We would like to thank all the visitors that came by over the weekend of September 27 and 28, 2008. When we added them up, we had about 100 visitors throughout the weekend. Weather was cool and friendly (not hot like last year), though rain threatened on Saturday morning, and a passing squall had us closing a tad early on Saturday evening. But everyone had fun and a lot of people got to meet the alpacas. We had a blast on the weekend, talking to lots of folks who came by to see the alpacas. Unfortunately we were too busy to take pictures. (Seems to happen every year.) So we can't show you what it looked like. You'll just have to come by for yourself next September. See you then! 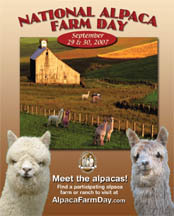 2008 Farm Day Update: Watch for a mention of Silver Thunder Alpacas in an upcoming story in ALPACAS Magazine. We get quoted in a story they are writing about National Alpaca Farm Day. Whoo hooo! Silver Thunder Alpacas would like to thank all those who visited our farm on Saturday, September 29th and Sunday, September 30th, 2007. Folks came from all over the area to meet our friendly alpacas. We had baby carrots for them to hand feed the alpacas and being up close allowed them to sink their fingers into their soft fleece and see why alpaca fiber is so highly prized. We had fleece and yarn samples to inspect and an all-day spinning wheel demonstration by local hand spinner Chris Feller. Everyone was able to feel their wonderful fleece and some even got to watch them play (when it wasn't too hot.) Folks came to learn why alpacas are such a desirable livestock, and why they are especially good for those on small acreage farms. Silver Thunder Alpacas celebrated National Alpaca Farm Day for 2007 on Saturday, September 29th, from 10am until 5pm. (We'd like to thank Chris Feller for the spinning demonstration on Saturday.) On Sunday, September 30th the farm was open from 1pm to 4pm to visit and feed the alpacas. We had a blast. It was a huge success. We will look forward to National Alpaca Farm Day every year from now on. If you missed this year, well . . .
We'll do it again next year! Save the dates September 27 and 28, 2008. Come see us again for next year's National Alpaca Farm Day. Please come by for a visit any time. Just give us a call. The Alpacas would love to meet you. We were pleased to be featured in a radio interview on Tuesday morning, September 25, 2007 when we got to talk about alpacas on radio station WJCW, am 910, Tri-Cities Talk Radio, out of Johnson City, Tennessee. Sometime after 8:10 in the morning we received a phone call from Carl Swann and Dave Hogan and they said, "Hey, Chuck, you ready to go? You're on right after the break." And thus we launched into a live radio broadcast of their morning show "Thinking Out Loud", informing East Tennessee about interesting things going on in the area. We talked for maybe ten minutes about alpacas and why we raise them and how a couple from California came to be living in good old Upper East Tennessee. We were featured in an OUTSTANDING article in the Greeneville Sun about "Alpaca Farms in Greene County". Timed for release in the days leading up to National Alpaca Farm Day, the article ran in the Agricultural section of the Sun on Thursday, September 27th, 2007. It featured three of the alpaca farms in Greene County, including yours truly, Silver Thunder Alpacas, and featured extensive interviews and really nice photos of our alpacas. It was a large story, nearly a full page, and was very accurate and complete in its coverage of alpacas and the farms here in Greene County, Tennessee. We'd like to thank Stephany Napier for her wonderful story. Visit an Alpaca Farm near you. And if you're in or near Greene County, then we invite you to visit us here at Silver Thunder Alpacas. When the site is operational, only during September each year, it's very easy to use. To find a farm near you, click on the link for your state and you will be shown all the participating farms, each with it's own clickable map. This will be an annual event held the last weekend of every September. The first year, 2007, there were more than one thousand farms participating throughout the country. Here in North East Tennessee there were five farms between the Smokies and Tennessee's northern border. Three of these are very close to the Tri-Cities, including one in Washington County and two in Greene County (and one of those would be US, Silver Thunder Alpacas.) Please come and visit. Click here to return to the Silver Thunder Home Page.